The House of Commons Science and Technology Committee has created an open opportunity for the science community and the wider public to suggest science and technology areas for scrutiny. Scientists are invited to submit their proposals for work in areas that might otherwise escape the committee’s attention. 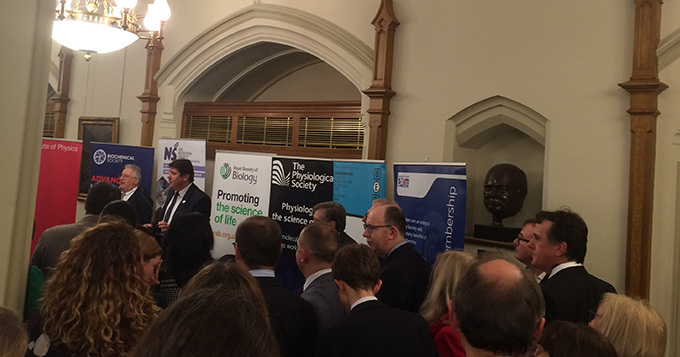 Speaking at the Christmas Parliamentary Reception hosted by the Royal Society of Biology last night, Chair of the Committee Stephen Metcalfe MP (pictured above) said that he was looking forward to seeing the responses. A selection of the proposals will be shortlisted for an opportunity to give a 10-minute pitch to the Committee in person at a public ‘Dragons’ Den’-style session to be held in the New Year. The deadline for proposals is Wednesday 4 January 2017.